If you have found yourself stuck and in need of a Tapioca flour substitute that a recipe calls for then fear not! Below you will find some good substitutes for tapioca flour that you probably already have in your kitchen. What is Tapioca Flour ? Tapioca flour is also referred to as tapioca starch just so in case you were a little confused between the two. Tapioca is an extracted starch from the root of the Cassava plant. It is basically tasteless and adds little to no nutritional value to a dish. Because of its high starch content if is used as a thickening agent in both sweet and savory dishes. Tapioca must be mixed with a liquid prior to use. Once mixed it forms a gel like substance. Given that it is almost purely carbohydrate it contains no gluten and as such is suitable for those on a gluten free diet. Hopefully you might have one of the below to hand in your kitchen if you are stuck. 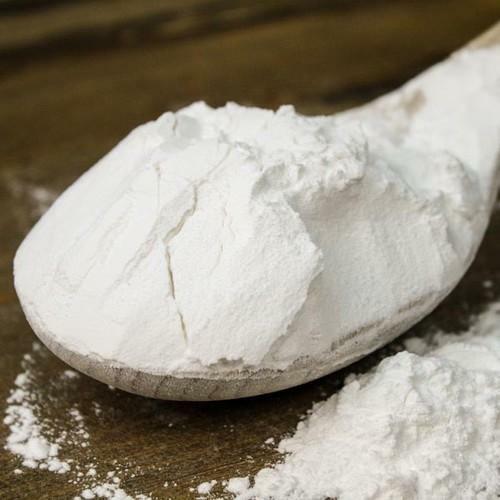 Almost every kitchen has cornstarch in it and these days with arrowroot becoming so popular if you don’t have any then maybe a neighbor might a tapioca flour substitute to help you out. Arrowroot is an almost perfect tapioca substitute. It too is all starch and gluten free. It has a similar thickening effect and can be used in an almost identical way. You should be looking at roughly a two to one ratio of tapioca to arrowroot. So for every 2 tbsp of tapioca required use 1 tbsp of arrowroot. Cornstarch is a excellent replacement for tapioca flour and as an added bonus it is readily available so you shouldn’t have too many problems getting your hands on some. Making a cornstarch slurry is the best way to use it in your baking and cooking. Like a lot of starches it is best added to cold water first and mixed thoroughly before adding to hot mixtures. Just like arrowroot above you should look at using a 2 to 1 ratio of tapioca to cornstarch for the correct replacement ratio. The one advantage that tapioca flour has over cornstarch is that if it is frozen in a pie for example, when it is thawed it will maintain its texture unlike cornstarch. Cornstarch can sometimes react badly to being frozen and then thawed when used as part of a sauce. Ordinary wheat flour can also be used as a substitution for tapioca starch. You can use it in a one to one ratio. Obviously wheat contains gluten so only use it if you are sure that the people eating your finished dish are not on a gluten free diet. How does tapioca flour differ from cassava flour? Although they are both made from the root of the cassava plant, they differ by how they are processed. Cassava flour if more like a traditional flour that is made from the cassava root. Tapioca flour however is an extracted starch from the root only. If is quite similar in how cornflour and cornstarch are different to each other despite both being made from corn. Quick cooking tapioca is a par-cooked twice in the form of tapioca pearls. It is what is usually used to make tapioca pudding.